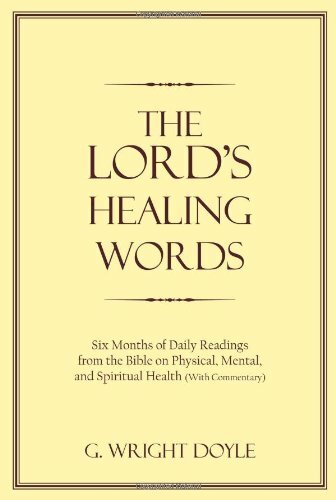 Based firmly upon the Bible, and touching upon almost every aspect of physical, mental, and spiritual well-being, The Lord’s Healing Words offers practical guidance for all who will take the time to read and apply its contents. Brief, clear meditations on 180 passages of the Scriptures will stimulate your own thought, prayer, and action to produce substantial change in your health and overall happiness. Just a few minutes a day could transform your life, as you allow The Lord’s Healing Words to change old habits and build new ones. Without offering any guarantee of a pain-free existence, this book does uncover the wisdom of God’s Word for a healthy lifestyle. In these pages you will also learn what the Bible says about sickness and pain; the connection between suffering and sin; healing from disease through “ordinary” means as well as prayer; and basic keys to mental health. Many readers will find the discussions of depression, abortion, Old Testament promises about healing, the “prayer of faith”, and demon possession especially helpful. A special section on men’s health addresses common problems and contains essential principles for a long, effective, and joy-filled life.